Comment: The first three words of the First Commandment provide a clue as to the antecedents of this commandment: Anochi Havayah Eloecha, meaning “I am God your Ruler.” These words are not originally Hebrew words. They come from Abraham's Nilotic ancestors. Anochi refers to the royal first person. The Rabbis speculated a length about the meaning of the word. In the Talmud (Shabbat 105a) they recognize that anochi is an unusual pronoun, but they recognize that it is related to the word Ani. The ruler among the Anu or Ainu was called Anoch (or Enoch). Anoch is a royal title. Neither is the word Ha-vayah of Hebrew origin. This is evident in that there is no V in the Hebrew alphabet. However, the V appears in many Nilotic words. In Luo, for example, V relates to separating, spreading out, or any valley between rivers. If the valley is circular it is called kikar (ring, disk, circle) as in "Kikkar ha-yarden" which is translated "all the valley of the Jordan" (Genesis 13:10). We have a clue as to the origin of the word Havayah in Genesis 2:11 which speaks of a region called Ha-vilah. This refers to the V-shaped place between the two main tributaries of the Nile as shown in the map above. 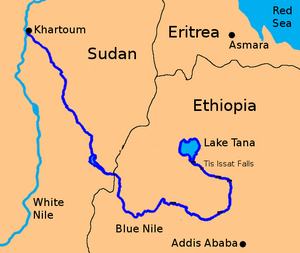 In Genesis 2:13, we are told that the Blue Nile was called the Gihon. This suggests that the White Nile was called the Pishon (Gen. 2:11) These rivers bound Eden on the west and the Tigris and Euphrates bound Eden on the east. Obviously, Eden was a vast and well-watered region. The word El is a very ancient name for God. Variants are Al and Elohim. Eloecha, the third word in the opening of the First Commandment, likely is a corruption of El-echad. Echad is an adjective meaning "a compound unity" and some Bible commentators hold that the Shema (Deut. 6:4) means Hear, O Israel: The LORD our God, The LORD is a compound unity. If this is correct, El-echad would be similar in meaning to another ancient reference to God: Baal-Shalisha, the Three God or the God associated with the number three. Abraham was visited by the Three Person God before the destruction of Sodom. The author of Genesis 18 struggles to describe this theophany, and presents the Lord appearing with two angelic beings. Baal Shalisha - usually rendered ‘God of three powers’ or ‘the third idol’ - is also inadequate. ‘Baal’ means Lord and ‘shalisha’ is the number three, so it is possible that the idea of a Triune God was already circulating before the time of Abraham. If this is the case, Christians cannot be accused of inventing the concept of the Trinity. What does it mean to have no other gods? Comment: In the ancient world there were castes or clans of priests dedicated to different gods. Abraham's ruler-priest ancestors (the Horim or Horites) refused to acknowledge any god except the one who created all things. The Creator was known by different names including Ra, El, Al, Elohim and YHWH. The Creator's emblem was the sun, an important symbol for the Horites. They oriented their shrines and temples toward the rising sun. In Canaan, their rulers were indicated by the solar cradle - Y - at the beginning of their names: Yaqtan, Yitzak, Yacob, Yisbak, etc. In very ancient scripts of Arabia, the sun symbol is a an orb - O. 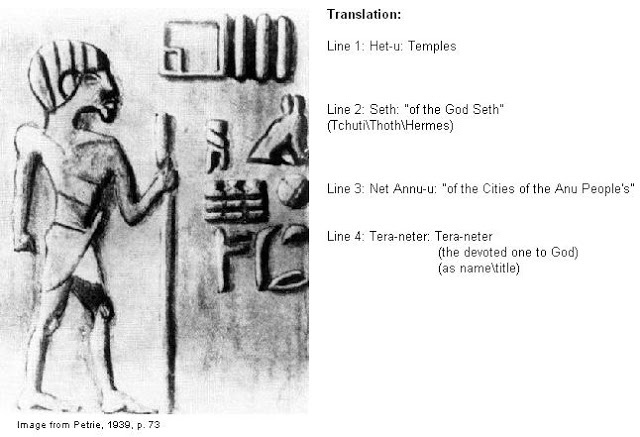 This appears in the older word for Hebrew was O-biru (O-piru), a reference to the sun temples. Horite temples were open to the sunlight and had no statues of the Creator because he was represented by the sunlight. At the center of the temple there was an obelisk and an altar. The most most prestigious of the Horite temple was in Heliopolis (Biblical On). This shrine city was erected by Abraham's Anu (Ainu) ancestors. Joseph married one of the daughters of the High Priest of On. 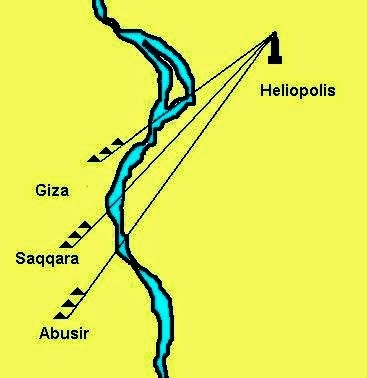 The pyramids of Giza, Zaqqara and Abusir were aligned to to the obelisk of Heliopolis. In the ancient world the Horite priests were known to be especially fastidious in the practice of their religion and in their moral behavior. Plutarch wrote that the "priests of the Sun of Heliopolis never carry wine into their temples, for they regard it as indecent for those who are devoted to the service of any god to indulge in the drinking of wine whilst they are under the immediate inspection of their Lord and King. The priests of other deities are not so scrupulous in this respect, for they use it, though sparingly." The Horite priests were recognized for their devotion to the Creator, for their sobriety, and for their purity of life. Before their time of service in the temple they prayed, fasted, shaved their bodies, ritually bathed, abstained from sexual relations with their wives, and did not consume wine. The oldest known Horite shrine city is Nekhen (Hierakonpolis) on the Nile, dating to about 4000 B.C. Here priests placed written invocations to the Creator and his son Horus in the summit wall as the sun rose. The son and the father were regarded are equal. Horus gave his name to the rulers of the Nile as he was the one to unite the peoples (Upper and Lower Nile) and therefore was crowned with two crowns (ataroth, cf. Zechariah 6:11). Messianic expectation appears to originate with the Horites who Jews call their "Horim." Can you worship God perfectly? Comment: The Son alone is able by his virtue to exalt the Father. When we are baptized into Christ, when we "put on" Christ, we enter into a radical new existence in which the Holy Spirit working in us enables us to please God. This is a process called "sanctification" or "deification." It is a great challenge because sometimes we try to do the work by our own strength. There is also the reality of spiritual warfare. Dark forces constantly work to draw us away from God and to make us stumble. These forces are far greater and more subtle than we generally imagine. C.S. Lewis explores this reality in his Screwtape Letters. How are you tempted to worship of gods? Human pride leads us to make our agendas more important than God's. Utopian ideologies would have people believe that social and political systems can save us. Social pressures distract me from God and can make me do the wrong thing. The honor due to God is given instead to celebrities. Sometimes I don't go to church. I spend Sunday on my personal device and play games with my friends. Sometimes I compete at online games with strangers. How we spend our time says so much about what we value. To the world we seem a strange people because as Christians we prefer to spend our time together. We prefer to read and study the Bible, and to gather whenever possible to worship the Holy Trinity. The manner of our lives is distinct and peculiar because we love God above all else. The world hates that about us, but before God we are a heavenly fragrance rising to the Throne of Heaven. The Code of Ani is worded negatively, like the Ten Commandments, and dates to c. 2500 B.C. It has 42 confessions. The text is Akkadian and the authority of the code is derived from the Horite Hebrew Creator Anu/Anum, father of the divine son, Enki. Among the Nilotic peoples, God the father was called Ra and God the son was called Horus. This suggests that the Ten Commandments and other codes found in Numbers, Deuteronomy, and Leviticus derive from an earlier tradition among the ancient Nilotes, Proto-Saharans and Mesopotamians. There is evidence of influence from the Law of Tehut which dates to around 3200 BC. 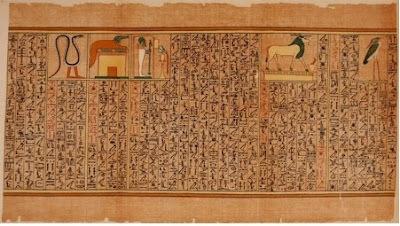 Clear parallels can also be found to later Nilotic writings, such as Spell/Prayer 125 in the Egyptian Book of the Dead (c.1500 BC). The word Ani is related to the Akkadian word anaku - the royal First Person, which resembles the ancient Egyptian anochi, which has the same meaning. It also refers to the Anu/Ainu priests who served at the most prestigious shrines throughout the ancient world. The AN root appears in variants such as Anoch/Enoch; Anakim; Ana; Annas; Ananus; Ananias and Hannah. The three Anakim clans were named for the three highest ranked sons of Anak whose names were Sheshai (Shasu), Ahiman and Talmai (Josh.15:14).The Shasu are mentioned in ancient texts as the "Shasu of YHWH." Two hieroglyphic references dating to the New Kingdom (1550-1069 BC) refer to “the land of the Shasu of YHWH.” These are the oldest references to YHWH outside the Bible. 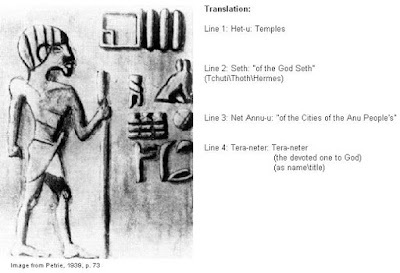 These inscriptions are found on the Nubian temples of Soleb and Amara West. Many high priests are named for Anu, the High God. The High Priest Ananus was appointed by Herod the Great. Another Ananus served as the High Priest of Edom/Idumea from 6-15 AD. Edom was home of some of the greatest Horite Hebrew rulers, and all of Abraham's territory was in the region of Edom. Edom was known as one of the ancient seats of wisdom. I have not debauched the wife of [any] man. I am not a stirrer up of strife (disturber of the peace). I have not snatched the bread of the child, nor treated with contempt the god of my city. I have written the little work that follows...in the role of one who strives to raise his mind to the contemplation of God and one who seeks to understand what he believes. The scepter shall not depart from Judah, nor the ruler's staff from between his feet [nor a lawgiver from his loins], until Shiloh comes, and to him shall be the obedience of the peoples. (Gen. 49:10) This relates to Christ who is the long-expected Righteous Ruler and the Lawgiver because every law that comes from God is given through Him. Mary is of the same lineage as the rulers named in Genesis 4, 5, 10 and 11. These kings are the ancestors of Abraham, Esau, Moses, Samuel, David, and Jesus Christ. They married and ascended to the throne according to a distinctive and unique pattern involving two wives. Further, they married within their Habiru/Hebrew ruler-priest caste and because of this practice (endogamy) it is possible, using the Biblical data and kinship analysis, to trace Jesus' ancestry back to the earliest named rulers in Genesis 4 (Cain's line) and Genesis 5 (Seth's line). Messianic expectation originated with these Horite rulers. Jews call their ancestors "Horim" which is rendered "Horite" in English Bibles. The Ten Commandments have antecedents in the moral law of these ancestors. The Christian moral law developed out of the ancient law codes associated with the appointed ruler-priests before the time of Abraham. Some of the laws attributed to Moses were already observed among Abraham's Habiru ancestors. The moral and ceremonial laws of the Jews have a long history of development among the Habiru and specifically among the Horites of the Nile Valley. The oldest known Horite shrines and temples have been discovered at Nekhen on the Nile. Between 4000 and 3000 B.C this was the largest city on the Nile and votive offerings found there are the largest and most impressive of any discovered at Nilo-Saharan sites. Horite priests placed invocations to Horus, the son of the Creator, at the fortress summit as the sun rose. This is the origin of the Vedic morning ritual (Agnihotra) and the Jewish Sun Blessing ritual (Birkat Hachama) that is performed every 28 years. With this background, we now take up the purpose and importance of the Ten Commandments for Christians. We begin on page 53 of the Catechism. My reflections appear in italics. Comment: The Ten Commandments express the measure of righteousness which is to be honored and upheld by the people and their righteous rulers. The catechism does not directly answer the "why" question that it poses. It describes the functions of the Ten Commandments, but not the why of the Commandments. To answer this question we must think in terms of Messianic expectation. The Righteous Ruler embodies the law and fulfills the law. Jesus Christ came that we might have life and have it more abundantly. This answers the question. The Ten Commandments were given that we might have life and have it more abundantly. St. Paul makes the distinction between law and grace, noting the obvious: the law tutors in the way of life whereby Jesus Christ is the Life. When did God give the Ten Commandments? After saving his people Israel from slavery in Egypt through the Ten Plagues, the Passover sacrifice, and crossing of the Red Sea, God gave them the Ten Commandments at Mount Sinai as covenant obligations. Comment: The Biblical narrative links the ascendancy of Moses as ruler over Israel to the giving of the law. Through Moses, the divinely appointed ruler, God covenants with the people to be his righteous ones on earth. Likewise, God covenants with the Church to be his righteous ones under the eternal reign of Jesus Christ. This covenant is superior to the covenant made with Israel because Jesus is superior to Moses. This is the message of the book of Hebrews and is stressed in St. Paul's epistles to the Romans and the Galatians. How did God give the Ten Commandments? Comment: The divinely appointed ruler was expected to have numinous experiences of God's presence. Such experiences involved "knowing" without words and images (apophatic) and knowing by means of words and images (kataphatic). Approaching the Creator through cloud is an example of the first. The stone tablets are an example of the latter. How should we understand the Commandments? Comment: The Ten Commandments are part of a greater received tradition which shapes the Church's doctrine and dogma. The tradition concerns the righteous ruler who was called the "son of God" and was responsible for the preservation and enforcement of the law. The law was not the basis of the covenant made with the ruler and his people, rather it was a sign of the covenant, but only when it was followed. Failure to fulfill the moral obligation was failure to be God's appointed people. The basis of the covenant with Israel and with the Church is one and the same: God's prevenient grace. This reflects the immutability of God. We are to understand the Ten Commandments as an expression of the divine wisdom whereby the Lord seeks to direct our individual and corporate paths in the way of righteousness. What is our Lord Jesus Christ's understanding of these Commandments? The scribe who asked Jesus what commandments is the greatest readily accepted the part about God being one. This was the national creed of the Jews (Shema), but he missed the point that our Lord was making. Love fulfills the law and without love the law remains unfulfilled. Fastidious observation of the law without love of God and others is soul-destroying legalism. Why can you not do this perfectly? Comment: One purpose of the Law is to show us the measure of our spiritual failings. In the Old Testament the ruler was to meditate on God's statutes day and night. If he hoped to serve God as one appointed to rule over the people he was to fill his mind with the wisdom from on High. Our sin-corrupted nature disinclines us to stay in God's Word. The ruler also had a priestly role and was to be faithful in the worship of God. We too are to be regular in attendance of worship services in our parishes. When will you love God perfectly? Comment: God promises to complete his work in us. Writing to the Philippians, St. Paul expressed this hope: "For I am confident of this very thing, the He who began a good work in you will perfect it until the day of Christ Jesus." (Philippians 1:5-6) The working out of God's will in our lives reflects the reality of the Holy Spirit striving with us to work out our salvation and the realization of God's eternal plan. The Greek word that appears in such passages is energeia, a term first used by Aristotle in his teleological writings. Consider Paul's explanation to the Colossians that it is Christ "whom we preach, warning every man, and teaching every man in all wisdom; that we may present every man perfect in Christ Jesus: whereunto I also labor, striving according to his working, which worketh in me mightily." The phrase "striving according to his working, which worketh in me mightily" is in Greek agonizomenos kata tēn energian autou tēn energoumenen en amoi en dunamei. Literally, this is striving according to the energeia of Christ that is bringing to fulfillment or realization that which God has purposed, and this should be taken in the teleological sense of Aristotle. Paul of Tarsus knew this sense of the term. Tarsus had one of the most famous philosophical academies of the Roman world. For Aristotle working out one's purpose in accordance with one's destiny requires the pursuit of that which makes one thrive (eudaimonism). For St. Paul working out one's purpose in accordance with one's destiny requires striving with the Holy Spirit (synergy). This is exactly the opposite of how Calvinists have employed predestination texts. Paul is not referring to a group of people foreordained to receive a pass to heaven. He is speaking about the power (energeia) of God at work in him so that he, cooperating with God, is able to bring to fulfillment or perfection what God purposes for him in this life. The Catechism affirms that the working out of God's purpose has a terminal point - the last day, when, seeing Christ our God face to face, we are finally and fully transformed into his likeness. Why then do you learn God's Law now? Comment: Jesus said, "Anyone who loves me will obey my teaching. My Father will love them, and we will come to them and make our home with them." (John 14:23) The Ten Commandments are a compass that point to true Love. The righteous meditate on God's statutes day and night that we may love God through obedience. All of Scripture is inspired and helpful for wisdom, salvation, and sanctification. How does God prepare you to begin living his Law? Comment: We who have been brought into Christ share with Him in his eternal Kingdom. This is too great for us now, but through the Holy Spirit's work in us, through the Sacraments, through obedience and study of Holy Scripture, we are being prepared for a glorious destiny on the day when sorrow will disappear and God will wipe away every tear. How does the Church help you to live out God's law? Comment: The Church is the earthly repository of the Gospel of Jesus Christ, the Son of God, who came into the word to save sinners, to reconcile us to the Father, to defeat death by death, and to restore perfect communion with our Creator. When church leaders fail to protect and preserve this sacred trust, when they stray from the path of righteousness, the people no longer hold God's Law in honor. One only need consider the past 20+ years of moral and spiritual decline in the Episcopal Church USA to see that this is true. How does the Lord's Supper enable you to continue learning and living God's Law? In the Lord's Supper or Holy Eucharist, I hear the Law read, hear God's good news of forgiveness, recall my baptismal promises, have my faith renewed, and receive grace to follow Jesus in the ways of God's Laws and in the word of his Commandments.